Your votes have been tallied; below lies the full list of the second annual PlayStation.Blog Game of the Year Awards winners as voted by you, plus Editors’ Choice picks from the PlayStation.Blog staff. Also, be sure to listen to our new episode of PlayStation Blogcast for more discussion and insight into our picks. 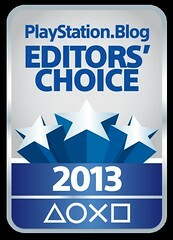 Read on to see the very best in PlayStation gaming for 2013 as chosen by PlayStation gamers worldwide. And please provide your feedback in the comments –- it’s always valuable. Ubisoft Montreal’s seafaring epic Assassin’s Creed IV Black Flag scored the Platinum award despite fierce competition from Killzone Shadow Fall. Battlefield 4 and PlayStation Store shoot ‘em up Resogun also secured award positions, with Call of Duty: Ghosts and Knack seeing plenty of votes despite not making the winner’s circle. Resogun – Battlefield 4’s majestic multiplayer modes nearly stole the show for me, but ultimately I had to choose Housemarque’s brilliant shmup based solely on the number of hours I pumped into it. The game is almost impossible to put down. Resogun – Housemarque’s deliriously exciting retro-fabulous shoot ‘em up scorched my eyeballs and seduced my senses, taking up permanent residence on my PS4. Call me an old codger if you like, but this is gaming at its purest. Love it. Assassin’s Creed IV Black Flag — Black Flag has an almost overwhelming amount of content sewn into a breathtaking slice of the Caribbean. It satisfies every craving, from swordplay to stealth, from customization to crafting. And perhaps most importantly, your crew sings shanties as you sail. The coolness of this cannot be overstated. Resogun — The true genius of Resogun lies in its deceptive scoring systems. Just when you think you know the best route to the top of the leaderboards, you discover a new trick that forces you to completely rework your now-obsolete strategies. In Housemarque we trust. Naughty Dog’s blockbuster The Last of Us dominated this year’s PS3 category, with Grand Theft Auto V also finishing strong. Ni No Kuni and BioShock Infinite rounded out the list of winners, though it’s worth noting that Beyond: Two Souls and Tomb Raider both saw robust support. The Last of Us – A highwater mark for PS3, and a welcome shot in the arm for all of us after a little more sophistication and nuance from our AAA gaming. Along with Beyond: Two Souls and GT6 it might have heralded the end of a console era, but it also felt like the start of something — and if this is the direction our blockbusters take henceforth, count me happy. Metal Gear Rising: Revengeance — Who knew that a cyborg samurai, action-RPG hybrid with stealth elements would rock so hard? Everyone. Everyone knew that, because it sounds awesome. In execution, developer Platinum Games crafted a blisteringly fast, endlessly satisfying combat engine with a fine, kung fu gloss. Brothers: A Tale of Two Sons — In only a few hours, Brothers explores the resilient human element that ties together the very best works of fiction in such a beautiful, fundamental way — and even more impressively, in a manner that only video games can accomplish. 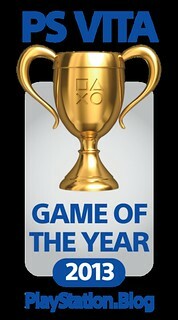 In a tight race for the PS Vita Platinum award, Media Molecule’s highly reviewed Tearaway ultimately prevailed. Killzone Mercenary’s strong showing earned it a Gold, while Rayman Legends and Soul Sacrifice filled out the PS Vita winner’s circle. Dragon’s Crown and Guacamelee! also scored plenty of votes, but not quite enough to place. Velocity Ultra – Tough category! For my money, Futurlab’s classy, clever blaster just pips the delightful Tearaway, Spelunky and Hotline Miami. No other game I played this year so brilliantly layered mechanic-upon-mechanic, slowly transforming you from slow-witted cannon fodder to master thumb ninja. Bring on Velocity 2X. Tearaway – One of the most creative games in the universe, with a lovable character, awesome level design, and the best use of the PS Vita features we’ve seen yet. Tearaway should be standard curriculum at videogame universities. Dragon’s Crown — Garbed in eye-popping fantasy art, Dragon’s Crown boasts a staggering degree of replayability. It invites return play, tempting us with glittering treasures and stage-searing spells. With six heroes to master and secret paths to traverse, Dragon’s Crown is as rewarding as it is beautiful. A tight race between Resogun and Far Cry 3: Blood Dragon ultimately went in favor of Housemarque’s addictive shmup for the Platinum prize. The newly released Minecraft: PS3 Edition and Guacamelee! also scored highly, just outpacing critical hits Hotline Miami and Brothers: A Tale of Two Sons. Brothers: A Tale of Two Sons (PS3) – At first, I wasn’t sure what to expect from Starbreeze’s daring new PlayStation Store title. Controlling two characters simultaneously, one with each analog stick, is novel. But Brothers backs it up with a story worth telling and characters worth caring about. Guacamelee! (PS3/PS Vita) – Drinkbox threw a bunch of my favourite things into a blender – classic Metroidvania mechanics, primary colours, Mexican food, chicken punching – and came up with a predictably heady confection. In a year of cracking 2D platformers, this was el pijama del gato (thank you, Google Translate). Super Motherload (PS4) — There’s a special sort of fun in tunneling deep beneath the surface of Mars, collecting precious ores, and unlocking game-changing upgrades. Super Motherload encourages smart plays with ore combinations, special items, and puzzles. Highly recommended. Spelunky (PS3/PS Vita) — Yep, more Spelunky. With the inspired Daily Challenge feature, I think I might slot it into my routine right after brushing my teeth before bed, until I’m stinky bones in the ground. Sucker Punch’s eagerly awaited inFAMOUS Second Son, out March 21st, handily scored the most votes, with Watch_Dogs, Metal Gear Solid V: Ground Zeroes, and Destiny duking it out for the remaining spots. Competition was fierce in this category, with strong showings from The Order: 1886, The Witcher 3: Wild Hunt, and Dark Souls II. One thing’s clear: the 2014 game lineup is looking bright indeed. inFAMOUS Second Son (PS4) – Sucker Punch. That is all. Well, my favorites were Dragon’s Crown and Ys Memories of Celceta. Great picks! They both got a ton of votes, but not quite enough to place. 2013 was truly an amazing year of gaming on the PS3, and the current and upcoming games on all the systems look to be intriguing. Can’t wait for inFamous and Dark Souls 2! Cant wait for 2014 on PS4. The Last Guardian didn’t win any Most Anticipated 2014 Game award :( That makes me a sad panda. It’s not announced for release in 2014 anyway, so it’s not qualified. So close to being first. Oh well. Glad to see soul sacrifice got fourth! Hundreds of hours of fun and worth every penny! Wish tomb Raider had done better, seriously underrated game! Merry Christmas to all and to all long gaming nights! Yo, no Ys: Memories of Celceta for us gamers to pick in the original poll? Kind of disappointed man…seeing as it’s also one of the best Vita games just recently released in 2013. Thanks to based XSEED for bringing it to us. It performed very well in the write-ins. i’m glad my votes helped ACIV and inFamous win!! One of the best years for the PlayStation family. PS3 killed it, PS Vita had a strong, if not very original, lineup. PS4 was the weakest link, but it’s just the beginning and the most anticipated games point to that. For me PS3 still has a pretty strong upcoming year to go : DARK SOULS II, FINAL FANTASY X/X-2 collection, FFXIII-3, Tales of Xillia 2, Kingdom Hearts HD 2.5, and also getting some good cross-gen games like MGSV GZ, and Destiny, Watch Dogs. Next year will be great. So the winners are gonna be on sale or something ? Thanks for putting this together Blog Team, this is a great perspective of the amount of quality games that released in 2013, and makes 2014 even more exciting! Happy to! Thanks for voting. Well, none of my favourites came out on to top, but I can’t disagree with the winners either. 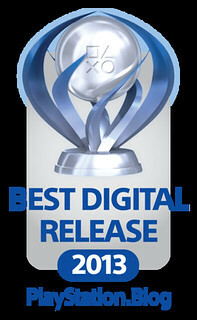 Great year to be a Vita gamer. Had a lot of fun with a crazy variety of titles. Heck, I don’t think I played more than one game in the same genre. Awesome results! I’m glad to see Ni No Kuni up there! Also, I don’t want to be rude, but the names are mixed up in multiple places, especially in the quotes. Thanks, fixed a few little bugs – anything else jumping out at you? good god. Minecrap got released last week .. and it got Silver ? UGH what is wrong with the Gaming Community these days. other games deserve it much much more then Minecrap besides the IP Owner of Minecrap don’t care about us Sony users i would award them anything but a Turd of the year if anything. Castlevania Lords Of Shadow 2!! not even nominated!?!? Got some write-ins but not enough to place. For me the best releases on PS3 were Gran Turismo 6 and Ratchet & Clank Into the Nexus. On PS4 Resogun. To be honest, the game of the Year for me is Resogun. It’s just ridiculous how addicting that freaken game is. It’s my childhood memories of gaming meshed with electronic music style I love, with amazing 1080p visuals running in flawless 60 frames a second. Next year my #1 game on list is Infamous Second Son. Then comes along my waiting for Driveclub, Destiny, The Order 1886, The Division, The Crew, Kingdom Hearts 3, along with hopes for at least an announcement of Gran Turismo 7, new Crash Bandicoot, and new Ratchet & Clank all for PS4. No love for GTA V? For shame! It got Gold on PS3! Though Minecraft PS3 Edition got silver? Didn’t it just come out last week or so? Too short a time to judge it a GOTY in my opinion. You’d better make a Knack sequel anyway! I know this is based on user votes but why are we rewarding a PS4 game that, while great, has some of the glitchiest trophies that blocks out users from two Trophies only because they have more than 100 friends? Even though they are aware, and despite the multitude of complaints and tickets issued (I had to delete over 40+ friends) – I never got to enjoy the 100+ PSN friends feature and made meeting new people on PSN a daunting task? Some issues are expected at launch, but to have a game 40 days after release without a fix of problems that lock us out of the Trophies is just not GOTY worthy. You can’t access the Kenway Fleet and, without buying an add-on for Elite upgrades, upgrading your ship to max is out of the question. Ditto for Sharing is Caring, and thirty hours of gaming, and a trophy glitching out on me no less, I had to start anew, so there goes my progress. Is it a good game? Absolutely. Did they work hard on it? Definitely. But what was supposed to be a fun game turned out to be a source of frustration for many Trophy hunters. My point is: we shouldn’t reward games that have glitchy Trophies that, 40 days post launch, still continue to exist. But at the same time, it’s what was voted for, I guess. 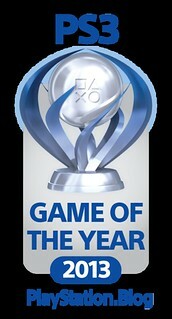 I’m so happy Ni No Kuni was chosen as one of the best PS3 games of the year, it really was an unforgettable experience. 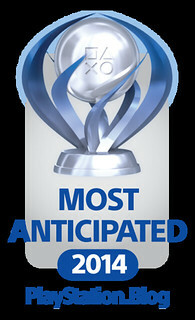 Little surprised and disappointed Dark Souls 2 didnt make the top for most anticipated. GT6 and Dark Souls are the main reason I have kept my ps3 after I bought my ps4. Either way happy holidays to the whole blog crew! Wow! Im glad I picked up Tearaway during the flash sale , I was pretty certainy KZ: Mercenery would take that Platinum. Can we have music on the PS VITA, when we launch a game? Just like the PS3 and PSP menu? but it’s the majority ..
1886 ’nuff said. Once people see more of this game, they will regret their choice. I can’t believe The Order didn’t place on the most anticipated. Exactly the games I voted for… looks like a lot of PS users have good taste too ;) 2013 was great… now I’m ready to see what you can do in 2014. Best vita game should have been killzone mercenary its the first game to push vita to its limits i dont understand why tearaway won for ps vita to survive we need more games like killzone mortal kombat need for speed uncharted assassins creed batman origins ect stop focusing on kiddy games like tearaway the vita has power USE IT!!!!! Metal Gear Rising: Revengeance was my favorite game this year. The Last Of Us, great choice and one of my favorites but Far Cry Blood Dragon was horrible and Minecraft PS3 was just released six days ago so I call BS there. Also, pernaonly I would swap Watch Dogs and Infamous… but get that Sony would “put” an elusive in 1st place. So glad to see The Last of Us get the love it deserves! It’s my personal game of the generation. GTA V was excellent as well but it’s essentially the same excellence they’ve been delivering since GTA III, Vice City, and San Andreas on the PS2. 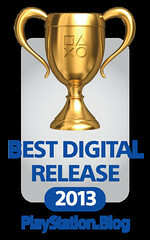 Best Digital Game = Guacamelee! 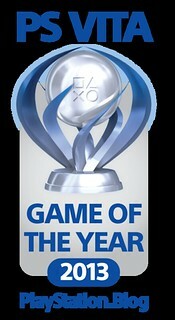 I’m happy to see PlayStation fans picked Tearaway as the Vita Game of The Year for 2013. Every Vita owner needs to buy this amazing game! Awesome! All the games I voted for won. =D.